Some call it the Paris of the Caspian; others purr that it is the caviar-producing region’s Dubai. But on the weekend of June 18th and 19th the comparisons were with Monaco. Baku’s first-ever Formula 1 race took place on a 6km (4-mile) street circuit in the heart of Azerbaijan’s capital. On the longest straight, cars screamed up to 354kph (220mph), whooshing past the imposing, Stalin-era Government House and a marble-paved waterfront promenade. The circuit also incorporated fiendishly tight chicanes in a section that winds picturesquely around the walls of Baku’s UNESCO-protected old town. The juxtaposition of medieval and modern architecture – the latter itself a mix of communist kitsch and modernist, skyscraping hotels and office blocks, built on hydrocarbon wealth – was stunning. “Wow! It’s all either centuries old or ten minutes old,” enthused a team official. 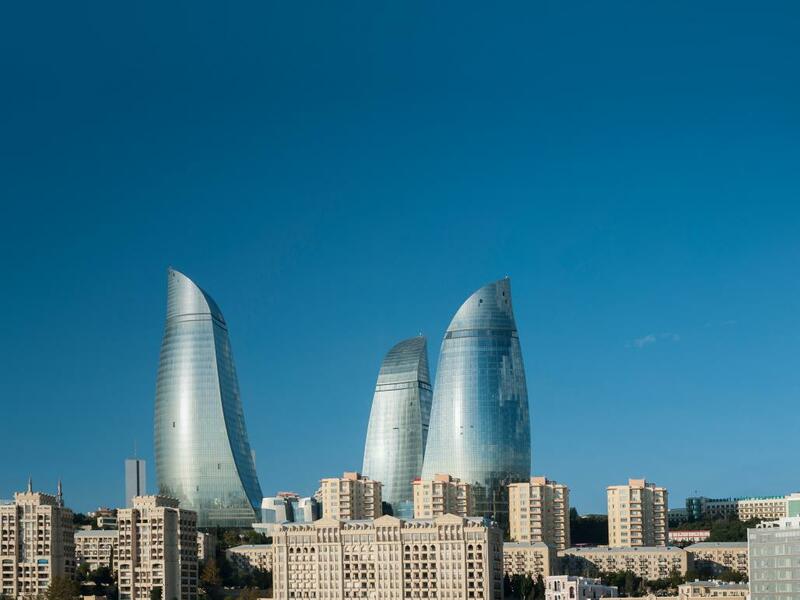 Draped over the side of one of Baku’s half-dozen five-star hotels was a giant banner announcing that “The speed is higher in the land of fire” (as Azerbaijan is known because, some say, of its flaming surface-oil deposits). At night the façades of Baku’s tallest skyscrapers (above) were turned into giant LED-display screens showing figures waving chequered flags. Adding to the sense of unreality were the hundreds of purple-sprayed London taxis on the streets. The race, truth be told, wasn’t terribly exciting. Having bagged pole position, Nico Rosberg of the Mercedes team led comfortably throughout. It lacked the sense of spectacle of Grand Prix extravaganzas held in Europe and Asia, which can attract crowds of more than 200,000. The children dressed as FI drivers, who paraded past the paddock during the opening ceremony, were waving to largely empty stands. There were plenty of unoccupied seats on the main grandstand. The FI “village” of shops, bars and cafés was often eerily quiet. There were 25,000 paying customers over the three days of practice, qualifying and racing. Azerbaijan may be oil-rich, but the wealth is unevenly spread: few of its 9m people could afford tickets, even when offered a 40% discount. Foreigners came only in dribs and drabs. The event’s boosters say it was Baku’s first shot at hosting; give it time. “Your first Grand Prix is always a prototype,” says Arif Rahimov, the chief race organiser (and son of Azerbaijan’s sports minister). The government of Ilham Aliyev says the race is part of a plan to develop tourism, thereby diversifying the economy away from oil, which accounts for the bulk of export revenues. But it is about more than putting bums on grandstand seats. Hosting FI is seen as a way to brand the nation, to get it noticed and respected. Grands Prix, with their global audience and high-end sponsors, are, as the Guardian, a British newspaper, once put it, a “must-have accoutrement for nouveau-riche nations”. FI will help to “put us on the map”, says Rahimov. Such events are about making sure “people far away no longer think Azerbaijan is the capital of Nigeria,” chortles Pierce O’Callaghan, a sports official who has lived in Baku. Critics say Grands Prix are at best vanity projects, and at worst “sportswashing”: used for propaganda purposes at home and to launder the regime’s reputation abroad. Aliyev succeeded his father, Heydar, as president in 2003 in a rigged election; he used a subsequent referendum to abolish presidential term limits. He plans to consolidate his power further in an upcoming plebiscite. Under its apparent leader-for-life, Azerbaijan has consistently persecuted critics. There are somewhere between 30 and 100 political prisoners. Among them is Ilgar Mammadov, a lawyer who was arrested in 2013 after toying with a presidential run. His supporters say he has been beaten in prison, possibly for refusing to plead for clemency. Azerbaijan ranks 163rd out of 180 countries in the Reporters Without Borders media-freedom index. You can be arrested for publishing, or even liking, the wrong sort of Facebook post. The European Court of Human Rights has ruled several times against the regime, only to be ignored. The government practises a revolving-door policy with critics, locking them up and releasing them when it is expedient. Dozens received pardons before Aliyev’s trip to a nuclear-security summit in Washington, DC, earlier this year. And just before the eyes of the world turned to Baku for the FI race, the Supreme Court, which is anything but independent, ordered the release of Khadija Ismayilova, an investigative journalist who had been detained in 2014, supposedly for tax evasion and other crimes, but in reality for writing about corruption. Ismayilova helped uncover vast corporate and property holdings linked to Aliyev and his family and held through offshore shell companies. These include interests in some of Baku’s hotels, a mobile-telecoms network and a gold-mine project, owned by the president’s daughters. The Panama Papers leaks earlier this year contained further revelations about the first family’s hidden wealth. At the same time as some critics are let out, however, others are tossed inside. At around the time of Ismayilova’s release, Qanun, one of Azerbaijan’s last remaining independent printing houses, was raided. After explaining unconvincingly that they had entered the premises because of a “bomb threat”, police carted away thousands of newly printed leaflets highlighting Mammadov’s plight. Meanwhile, the regime is squeezing the life out of the country’s only independent newspaper, Azadliq (“Freedom”). It faces closure because the state-owned news distributor, which is said to owe it $50,000, is demanding money instead of paying its bills. Two relatives of the paper’s exiled editor-in-chief recently received long prison sentences on trumped-up drugs charges. Meydan TV, an independent website, is under investigation for “abuse of power”. Those who regain their freedom live under a shadow. Intigam Aliyev (no relation), a human-rights lawyer, was released from prison in March but still faces a fine for “tax evasion” equivalent to tens of thousands of dollars. Even if he wanted to pay, he could not, for his bank accounts have been frozen. He may therefore lose his modest house on a dusty back road in Saray, a village north of Baku. He has been stripped of his office and computer, but doggedly continues to represent clients, working from a small table in his living room. Rebecca Vincent, a former United States diplomat in Baku who now works with Sport for Rights, a campaign group, says FI and its sponsors “should be ashamed to allow themselves to be used as a propaganda tool”. 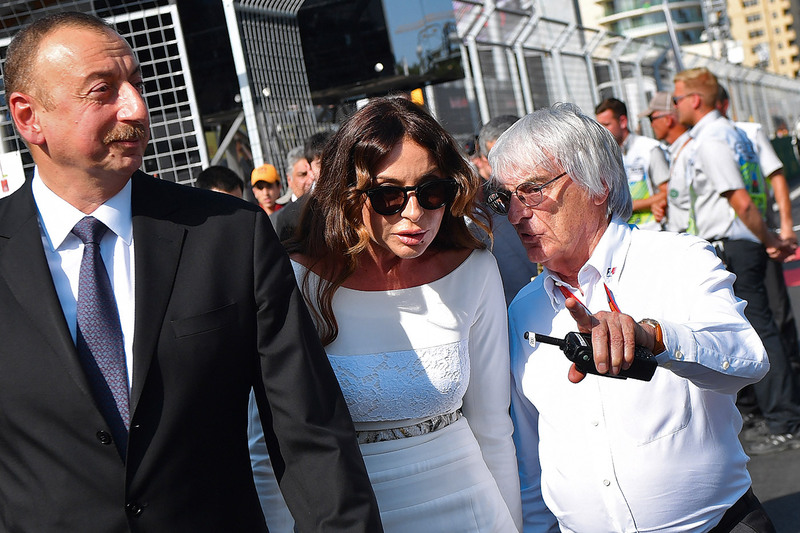 Bernie Ecclestone, the diminutive octogenarian who runs the sport, shrugs off such criticism. FI has been here before, most recently in Bahrain. It unashamedly follows the money, not the moralists. It did develop a human-rights policy, of sorts, after the brutal suppression of protests in the Gulf state, but it can hardly be said that Ecclestone owns this. He declared before the Baku race that, with regard to human rights, “everybody seems to be happy there”; when challenged at the trackside he suggested that starving people have more to complain about than those locked up for their beliefs, and that there is usually a reason why someone is in prison. Even for those who don’t believe in mixing sport and politics or who think sporting events can spark positive political change, this was toe-curling stuff. But it is not surprising that Ecclestone sees the bright side of things in Baku. Azerbaijan has committed to run an FI race for five years. It’s thought to have paid more than $30m for the first year’s rights; the figure will rise each year as the race becomes more established, under an “escalator” arrangement. On top of that, infrastructure and organisational costs (security, asphalting cobbled streets, and so on) run into the tens of millions. “Bernie is quite up front. He tells new venues ‘You won’t make money on it but it’s quite an event to showcase, and the cost is tiny compared to hosting the Olympics or a World Cup’,” says Sir Martin Sorrell, an FI board member. It is not hard to spot a theme here. Azerbaijan is desperate to be seen as part of the European family, despite being inconveniently located in the South Caucasus, to the east of its ethnic brethren in Turkey. Its FI race was branded the Grand Prix of Europe. That was “a bit cheeky”, chuckles Sir Martin. Azerbaijan is looking to buy more than honorary membership of the European community. It wants to be seen as a modern, stable, secular, majority-Muslim ally in a restive region, and as a reliable partner in energy and security matters, by helping Europe to diversify its supply of oil and gas away from less friendly states, for instance. In this, it is working with the grain of geopolitics. Western governments’ view of the country as a key ally in the Caspian region often overshadows their concerns about its human-rights record. The Southern Gas Corridor, a giant gas project, has become a crucial part of Europe’s strategy to become less reliant on Russia for its energy needs, says Livia Paggi of GPW, a political-risk consultancy. Azerbaijan is also helping to limit Iran’s and Russia’s influence in the Caspian region. Israel has often used Azerbaijan as a base from which to monitor Iran’s activities in the region and has sold lots of arms to Azerbaijan. But even though strategic concerns dictate that Western powers look kindly on Baku, the regime is not taking chances. It employs an entire industry dedicated to tipping things further in Azerbaijan’s favour. This involves lobbying in the West using consultancies and PR firms, arranging paid-for junkets for its politicians to conferences in Baku’s swankiest hotels and plying foreigners with gifts, including rugs and the fishy delicacy that gives “caviar diplomacy” its name. The activities of the European Azerbaijan Society include organising cultural events, lobbying European lawmakers and arranging visits to Baku. It is run from London by Lionel Zetter, a veteran lobbyist, and chaired by Tale Heydarov, son of Azerbaijan’s minister for emergency situations. A corporate investigator calls TEAS “the Europe-focused, unofficial Foreign Office/State Department for the Azeri government, a mouthpiece for its elite families” (Zetter calls that description “inaccurate”). Documents obtained from Britain’s Foreign Office, following a freedom-of-information request, show extensive communications between TEAS and officials in recent years. These include discussions of TEAS’s interest in sponsoring political, trade and investment events. (At a jazz reception it organised at the Labour Party conference in 2013, Azerbaijan won praise for being “on the way to becoming a fully fledged democracy”.) An undated annexe says TEAS is “well known” to officials and “cultivates many parliamentary relationships”, paying for MPs and peers to visit Azerbaijan, and tabling debates and parliament­ary questions. The Foreign Office, the annexe says, has been “supportive but non-committal” on increasing ministerial engagement in response to teas lobbying. An email notes that TEAS has won celebrity endorsements from Mo Farah, an athlete, and Frank Bruno, a former boxer, for a motion in parliament connected to Azerbaijan’s long-running dispute with Armenia over the disputed territory of Nagorno-Karabakh (both sportsmen have raised money for refugees from the conflict). TEAS says its funding comes entirely from member subscriptions and donations. Suspicions linger, however, that some of its money originates from the government or elites in Baku. The source matters because TEAS serves as the secretariat for the House of Commons all-party parliamentary group on Azerbaijan. That group’s chairman, Conservative MP Bob Blackman, is a regular visitor to Baku, most recently leading a delegation there in July. Another British politician with links to Azerbaijan through TEAS is Liam Fox, also a Conservative MP, who was recently appointed secretary of state for international trade. In 2014 TEAS became the first – and so far only – organisation to request translation rights to “Rising Tides”, Fox’s barely noticed book on globalisation. It reportedly paid £5,700 for the privilege, as well as his travel expenses for the launch of the Azeri edition. 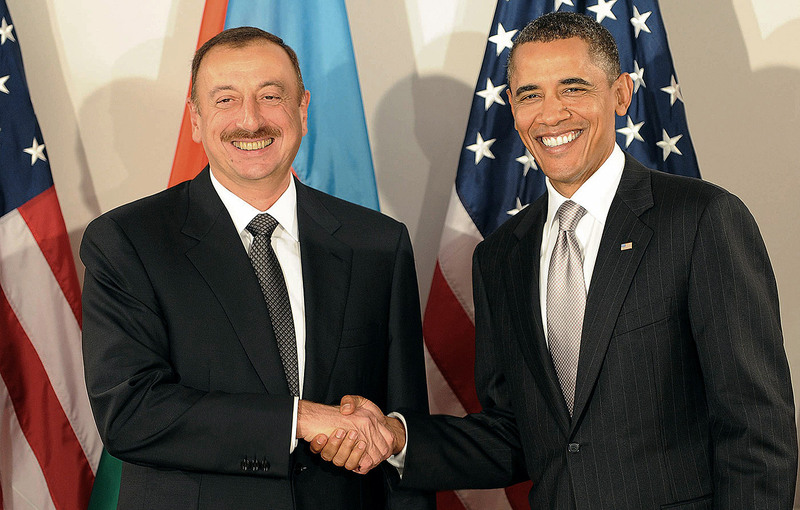 Fox subsequently met President Aliyev in Baku, and later criticised Europe’s human-rights campaigns as a waste of money. At the European level, much of Azerbaijan’s effort has been directed – largely successfully – at the Council of Europe (COE), an organisation focused on promoting democracy, the rule of law and economic development across the continent. Controversially, Azerbaijan has been admitted as a member and was even chair of its committee of ministers during a particularly harsh crackdown on its domestic critics in 2014. The COE is divided on Azerbaijan. It has pulled out of a “dialogue” with NGOs that the government in Baku set up last year, deeming it to be a sham. Its secretary-general, Thorbjorn Jagland, has called Ilgar Mammadov’s detention “deeply disturbing” and last year launched an inquiry, a rare move against a member state. But most COE member states “have little interest in letting such concerns interfere with their strategic priorities”, says an insider. Lobbying at the COE has been focused on the body’s parliamentary assembly, known as PACE, which is Azerbaijan’s clearest institutional connection to Europe. The European Stability Institute, a think-tank, has reported that Baku “silenced” criticism within PACE by courting members including its current president, Pedro Agramunt. Agramunt says the ESI’s allegations are “not true”. However, PACE has often gone soft on Azerbaijan, toning down criticism of its human-rights violations and iffy elections. Only in the past year or two have its rapporteurs even used the phrase “political prisoners” in their reports. A well-placed source notes that whenever there is a vote connected to Azerbaijan, many PACE members who usually don’t bother voting show up, because “Baku is good at mobilising support”. Among those lobbying for Baku in recent years have been current and former PACE members from Scandinavia and the Baltic States, and a former ombudsman who once ran for the job of COE human-rights commissioner. In June it emerged that prosecutors in Milan have accused Luca Volontè, an Italian politician, of accepting bribes of more than €2m from Azerbaijan while leader of a faction in PACE. In return, he allegedly opposed a critical report on Azerbaijan and persuaded others to do the same. The report, prepared in 2013 by Christoph Strässer, a German parliamentarian, contained a list of 85 alleged political prisoners in Azerbaijan. It was controversially rejected by PACE, by 128 votes to 79. Magistrates have reportedly said they believe the alleged bribes originated from an Azeri state-owned telecoms group. Volontè has denied wrongdoing through his lawyers. Arif Mammadov, a former Azeri ambassador to the COE and the EU but now a dissident, says his former employers are good at identifying PACE members who might be willing to support them: typically those closer to retirement age who are keen to do some late-career nest-feathering. 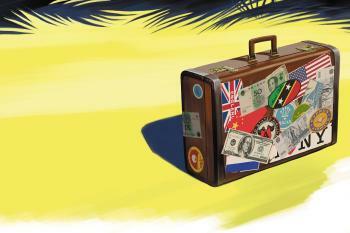 They are lured with gifts and promises of five-star travel for them and their spouses. Mammadov says he knows of cash payments too. He notes that the European Parliament has passed resolutions condemning Baku’s human-rights record, but he believes the European Commission, the EU’s executive, “has never been as soft on them as now”. The EU and Azerbaijan are edging towards a new strategic partnership agreement. Erkin Gadirli of REAL, an opposition movement in Azerbaijan which manages to operate from a small, functional office in the capital despite facing numerous restrictions, says the lobbying at the COE “works because Azerbaijan’s profile is so low that many politicians there think the risk of going along with it is low too. Which of their constituents would notice?” In the process of trying to clean its own reputation, he argues, Baku has sullied that of an important European institution. In America, the Azeris spoon out caviar diplomacy through their embassy, through SOCAR, the regime’s oil company, and, until recently at least, through the Azerbaijan America Alliance (AAA), an American version of TEAS. They also work with lobbying firms, including Podesta Group, co-founded by Tony and John Podesta. The latter was chief of staff to Bill Clinton and an adviser to Barack Obama, and now chairs Hillary Clinton’s presidential campaign. The firm signed a new, $50,000-per-month contract with Baku in February, just ahead of President Aliyev’s visit for the nuclear summit. It looks to have been money well spent: the president got a pat on the back in a photo-op with Obama, and met a senior executive from GE (a big investor in Azerbaijan) and the head of the US Export-Import Bank. Meanwhile, America’s ambassador in Baku continues to steer clear of highlighting specific cases of human-rights abuses, welcoming the “positive direction” of change, bearing in mind that “democracy is a process”. “Is America really that cheap to buy?” asks the recently released investigative journalist Ismayilova. Podesta Group is also believed to be trying to drum up opposition to a bill in Congress called the Azerbaijan Democracy Act, which would impose visa sanctions on Azeri officials over human-rights violations. Lobbyists place articles in newspapers and the authors are not always open about their affiliations: the New York Times published an editor’s note in 2014 pointing out that an academic who wrote a pro-Azerbaijan piece had failed to disclose to the paper that she had been an adviser to SOCAR. For chutzpah, this pales in comparison with a jolly that took place in 2013. Nine members of Congress and more than 30 of their staffers were given an all-expenses-paid trip to a conference in Baku, where they received rugs and crystal tea sets. According to a report from the Office of Congressional Ethics, this was funded by SOCAR through a web of non-profits. American politicians are prohibited from accepting money from foreign governments. SOCAR has denied any deliberate deception. Casey Michel, a journalist who investigated the case, calls it “the most egregious ethics violations Washington has seen since the days of uber-lobbyist Jack Abramoff” more than a decade ago. The junket appeared to pay off for Azerbaijan: several of the politicians who went on the trip attached their names to pro-Azerbaijan energy bills and amendments. The AAA spent an estimated $10m between 2011 and 2014, according to the Sunlight Foundation, an open-government advocacy group. It is presided over by Anar Mammadov, another minister’s son (this time the transport minister) and a one-time business partner of Donald Trump in the ill-fated, sail-shaped Trump Hotel and Tower Baku, which has been a ghostly shell since construction stopped last year. The AAA was set up, in part, to counter the powerful Armenian lobby in America, which Zbigniew Brzezinski once referred to as one of the three most influential foreign-ethnic lobbies in Washington. With coaxing from the AAA, several state legislatures, including the Oklahoma and Illinois senates, have passed resolutions praising Azerbaijan; Illinois cooed that it “shares American values”. Many of the resolutions’ sponsors had attended conferences in Baku organised by the Turquoise Council for Americans and Eurasians, a Houston-based group linked to a moderate Turkish Islamist, according to an investigation by Buzzfeed. Another Azeri tactic is to use its close connections with third countries for lobbying purposes in America – and not always transparently. In an article published in Foreign Policy in April, Bethany Allen-Ebrahimian described how she “accidentally became a lobbyist for Azerbaijan”. She attended what looked like an interfaith event at a Washington hotel, only to find herself shuttled to Capitol Hill to help win over members of Congress concerned about the Aliyev regime’s repressive tendencies. This was done by touting Azerbaijan’s strong relationship with Israel, a key American ally. The Azeri elites also burnish their image through association with the great and good of Western society. This is particularly true of London, where they own oodles of property and, reportedly, a fancy restaurant whose website says its proprietor is TEAS’s very own Lionel Zetter (he declined to comment on its ownership). They have reached all the way to the top of the social order: Azeri dancers performed for Queen Elizabeth’s 90th birthday celebrations, earning the Republic of Azerbaijan “grateful thanks” on the acknowledgments page of the programme, ahead of more familiar corporate sponsors like Jaguar. Baku has paid numerous British bigwigs as hired hands. Tony Blair helped plug a pipeline deal and reportedly earned nearly $150,000 for speaking at the opening of a methanol plant in Azerbaijan. Prince Andrew has helped negotiate several energy deals. He is said to have met Aliyev many times and to enjoy a warm relationship with him. The government has spent heavily on British PR firms, including Bell Pottinger, whose expertise in the industry’s darker arts – such as rewriting clients’ Wikipedia entries – is well documented. Some suspect the firm of being behind Aliyev’s appearance on the Times’s list of 100 people to watch in 2012. But the PR firm with the closest ties to Azerbaijan’s first family is Freud Communications, headed by Matthew Freud, a great-grandson of Sigmund Freud. It has, as one former associate puts it, been tasked with “branding the despot’s daughter”, Leyla Aliyeva. 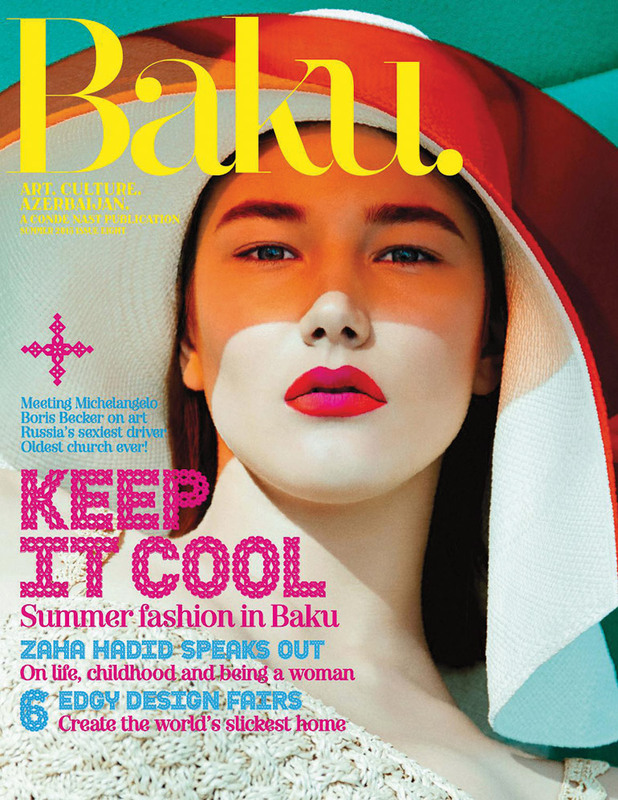 The firm works closely with Aliyeva on Baku, a glossy magazine that is published quarterly by Condé Nast. Officially she is editor-in-chief, though much of the content is overseen by Darius Sanai, a Condé Nast editorial director. The publication has helped smooth her passage into London high society. Its launch party in 2011 was covered by Tatler, another Condé Nast publication. Baku is soft power at its most airbrushed. It touts itself as an “edgy” international arts, culture and style magazine that “flies the flag” for Azerbaijan. All fashion, fine food and Ferraris (with the occasional page or two reserved to show off Aliyeva’s own artistic creations), there is, alas, no room to reflect life as it is lived by the vast majority of Azerbaijan’s population. During one shoot for the magazine, a photographer snapping ordinary Azeris going about their business was told by officials who had been shadowing him to focus on modernity instead of “poverty”. Baku has also opened up access to London’s art scene for Aliyeva. Simon de Pury, former chairman of Phillips de Pury, an auction house, and an editor-at-large of the magazine, has been closely involved, as both an organiser of shows and as a collector. Needless to say, there is no place in the shows for Azeri art with an anti-government message. In 2013 Spear’s, a magazine for the rich, ran an article about Azerbaijan’s use of art for propaganda purposes. Several passages were later pulled from the online version, following complaints from Baku’s reputation-guardians. “Up to a degree, art has always been used as PR,” de Pury told a Spear’s reporter in 2013, when asked about his connections to Azerbaijan. There is “nothing wrong” with that. “You’re not going to tell me that in Baku any of these artists are prescribed how they have to do their art?” Rebecca Vincent, the former diplomat, was thrown out of Azerbaijan in 2013 after launching a campaign that used art to promote democracy. 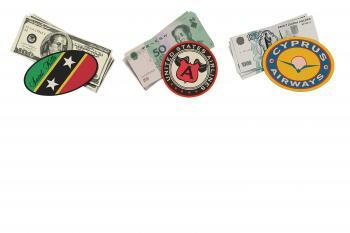 De Pury is also involved with shows of foreign art held in Azerbaijan. In June, for instance, he and Aliyeva cut the ribbon to open an exhibition of works by George Condo, a contemporary American artist, at Baku’s Heydar Aliyev Centre (which was designed by Zaha Hadid). This featured a composition entitled “I love Baku” in the park in front of the building. Azerbaijan is big in art patronage. According to press reports, a government-linked foundation has paid for numerous restoration projects in France: at a medieval church in Normandy, at Strasbourg Cathedral and at Versailles, as well as giving €1m to the Louvre. Some see all this as an attempt to butter up the French government, which has closer diplomatic ties to Armenia than Azerbaijan. A number of these stranger PR exploits have involved the president’s wife, Mehriban Aliyeva. She is, on paper, quite the Renaissance woman: a member of parliament (elected with 94% of the vote); head of charitable and arts bodies; and a UNESCO ambassador. These projects “provide a constant array of goodwill photo opportunities and advertisements”, according to a leaked American diplomatic cable. So great are Mrs Aliyeva’s works that in October 2015 she was nominated for a peace prize by an obscure organisation called the Swedish Peace Agency, whose president, Rez Aghapoor, is an ethnic Azeri. When a journalist inquired about the award, Aghapoor threatened to sue her. Statues of Mrs Aliyeva, apparently paid for by the government, have popped up in various towns and cities across the West. One, displayed in the small Canadian town of Niagara-on-the-Lake, showed her styled as a divine muse. Westerners may regard some of this as ham-fisted, but they are probably not the intended audience. These efforts are designed to persuade Azeris that the country is respected abroad and thus to discourage opposition. Azerbaijan’s compliant newspapers and broadcast media are full of such stories. So breathless was their coverage of the European Games that many Azeris thought they were hosting the Olympics (which Azerbaijan bid, unsuccessfully, to host in 2020). If they also confuse the Swedish Peace Agency’s prize with the better-known Nobel one, so much the better. As for FI, an official was obediently quoted in local media describing the event as “a sign of the international community’s recognition of the progress achieved by the country in political, social, cultural and other spheres”. One aim of caviar diplomacy is “to send a message back home that there is nothing that can be done to remove Aliyev, and to signal that the West is behind him,” says Rasul Jafarov, a lawyer and human-rights campaigner who was imprisoned in 2014 and released in the pre-nuclear summit pardon. When a foreign politician or legislature pats the regime on the back, it can help persuade Azeris that “the world outside is not much different”, according to another critic. They read about foreign governments praising Azerbaijan for its stability; or for acting as a broker in international affairs (as its newspapers said it did recently in helping calm tensions between Turkey and Russia); or for hosting grand-sounding but not very important multilateral events, such as the UN Alliance of Civilisations forum on intercultural dialogue, held in Baku in April. Others view the games as an expensive flop. Outside Azerbaijan, barely anyone knew they were happening, let alone watched them, but hosting them cost between $1.2 billion and $5 billion – either way, more than Azerbaijan’s annual education budget. 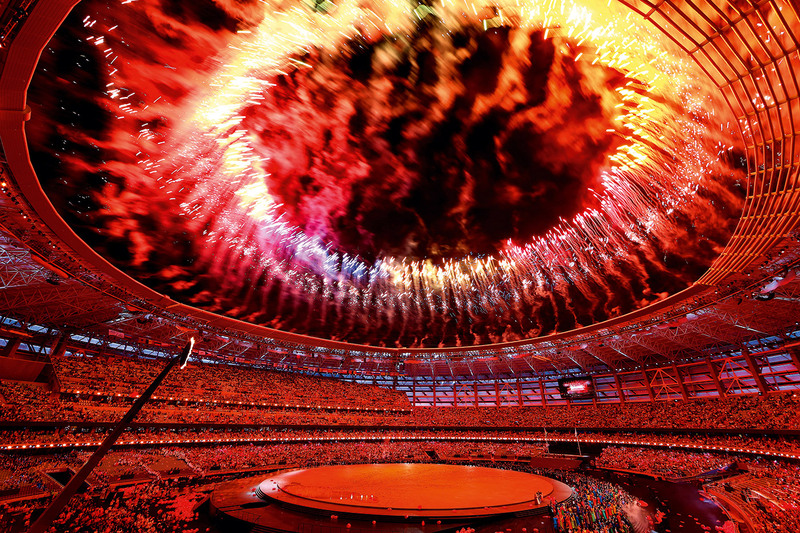 The bill for the opening ceremony alone was more than twice the $42m that London spent on its curtain-raiser for the 2012 Olympics. The purpose-built facilities included a 6,000-seat “Aquatic Palace”. Azerbaijan paid the travel expenses of all 6,000 foreign athletes, to ensure that they turned up. (It did at least get some sponsorship dollars from BP, though the company is likely to have put its name behind the games more as a favour to Aliyev than as a way of promoting its brand.) The European Olympic Committee “sold Baku a lemon”, says a diplomat. The European Games concept has since struggled: the Netherlands pulled out of hosting the second games, due in 2019. Russia wants to take its place, but its doping scandal means that is unlikely. An economic downturn raises questions about whether the government can continue to splash out on projects to buy loyalty and support. Azerbaijan was clobbered by the sharp fall in the oil price in 2014 and 2015. It has since suffered multiple devaluations and a budget crisis. The economy is expected to shrink by 3% this year. In January protests broke out over bread prices in several towns. Banks are wobbling; foreign-exchange reserves have dwindled to $4 billion. Public servants are no longer receiving the envelopes that unofficially top up their salaries (sometimes doubling take-home pay). Disgruntlement over Azerbaijan’s caviar diplomacy appears to be growing at home. During FI, taxi drivers grumbled openly about the wisdom of splashing out in straitened times. It was apparent to any visitor who ventured more than a couple of hundred yards beyond the glitzy central waterfront district – dubbed the “belt of happiness” by disaffected locals – that there was a Potemkin quality to the event. Abroad, some of the regime’s pet lobbying organisations have seen their funding cut. Earlier this year Dan Burton, a former US congressman and chairman of the AAA – a job that involved organising galas and writing op-eds – resigned from the organisation, citing non-payment for his services. But tighter finances may force Aliyev to do more courting of foreigners in order to secure foreign investment in the Southern Gas Corridor and other big energy projects. Certainly Rahimov, the organiser of the European Grand Prix, is looking forward to an even grander spectacle next year. But it is also possible that the more international extravaganzas Azerbaijan hosts, the harder it will be for other countries to ignore its human-rights violations. Intigam Aliyev, the recently released lawyer, is in no doubt that the FI race has raised the profile of regime’s critics. “Thank Ecclestone for me,” he said with a chuckle. Too much caviar, and even the most hardened gourmand will feel a little sick.